To choose the right corrective action form you need to understand the D(s) involved with corrective action. The D stands for Discipline. There are 3 main corrective action types and these are 5D, 8D, and 9D. There are 9 different Ds that support each type. These are D1, D2, D3, D4, D5, D6, D7, D8 and D9. This article explains the differences between the Dx steps and how to select a corrective action method that fits a given situation. D1, D2, D3, D4, D5, D6, D7, D8 and D9 are the individual steps within a corrective action process. 5D, 8D, and 9D are the full corrective action methods. They consist of the Dx (where x is 5, 8 and 9) corrective action steps and include the previous steps. 8D consist of D1, D2, D3, D4, D5, D6, D7 and D8 steps. 5D consist of the D1, D2, D3, D4 and D5 steps. 9D consist of the D1, D2, D3, D4, D5, D6, D7, D8 and D9 steps. If you create a 5D corrective action form, you need to make sure you include the D1, D2, D3, D4 and D5 steps. The same is true for a 8D and 9D corrective action form. 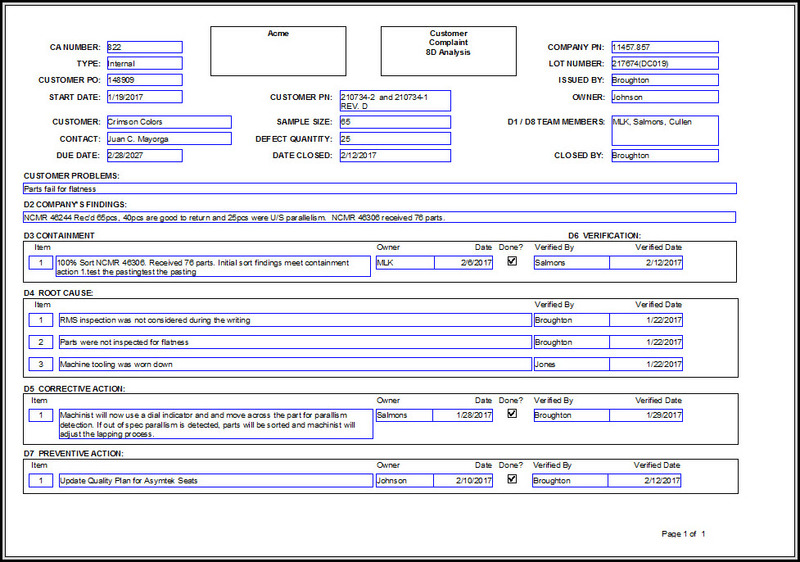 8D Manager Software with 5D, 8D, 9D, and RMA report generator. Corrective action software for every company needs. D1 stands for forming a team. D2 stands for identifying a problem. D3 describes the containment actions you take to prevent the problem from getting to a customer. Or if it is at the customer, how you get it away from the customer. D4 stands for identifying the root cause of the problem. D5 describes the corrective actions you take to permanently fix or remove the problem. D6 describes the preventive actions you take to further prevent the problem from occurring again. D7 identifies the verification steps you take to make sure D3 through D7 (and D9) are complete. D8 stands for congratulating the team. D9 stands for risk and / or safety actions taken as the result of the corrective action. For more details on the Dx steps, see this article. Short corrective action form usually require a 5D investigation. Which means you form a team, you identify a problem, you take containment actions, you identify the root cause and you issue corrective action. More important corrective actions require an 8D investigation. This includes the 5D investigation plus you conduct preventive actions, you verify all the previous actions and you congratulate the team. Some companies require an 9D investigation which includes the 8D and add Risk / Safety Actions. Selecting a Corrective Action Form Method. Many companies struggle with determining the corrective action method that best suits them. In fact, for many small companies, or companies new to corrective action, they may have not documented their method or given it much thought. Because of this, they may use different approaches depending on the individual handling the complaint. This causes an unwanted amount of variation when it comes to conducting corrective actions. Further, this causes confusion at the customer location, confusion with auditors and confusion with management. I recommend a multi method approach based on the situation. 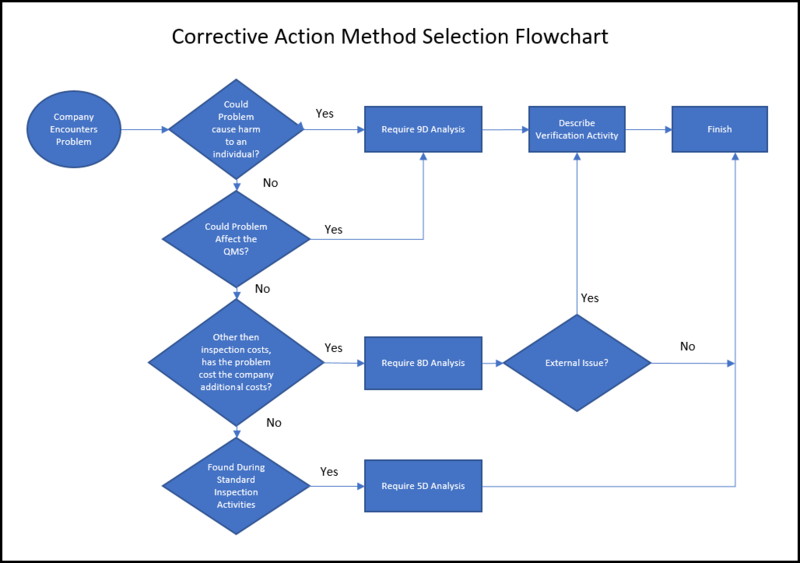 Below is a flowchart that you can use for selecting a corrective action form depending on the situation. Please download and edit to your needs. You can use this flowchart whether the problem / complaint / defect / issue started internally or externally. The first question, you should answer... could this problem cause harm to an individual? If this defect can hurt someone then conduct a full 9D investigation. You need to make sure these defects don’t escape your company. Your corrective action must assure you permanently fix the problem. In addition you need to make sure the root cause of the defect doesn’t spread to other parts. If people were harmed or could be harmed, you need to address this too. The 9D investigation assures these actions occur. Does the Problem Affect the QMS? The new requirements of ISO 9001:2015 requires Risk Analysis. Plus, ISO based most of the other QMS standards on the ISO 9001:2015 standard. Auditors now audit for Risk Management and how it affects your QMS. If the problem or defect affects the QMS, you need to conduct Risk Analysis on that issue. This means you should conduct a 9D corrective action form investigation and make sure the identified risks feed into your corrective action software (8D Manager!) and your QMS Management review. Company’s usually set up inspection stages to catch possible normal issues. Inspections include process, final, receiving, SPC, shipping and many others. If the issue got past the inspection and caused any unsuspected costs to the company, then issue an 8D Analysis. What kind of unsuspected costs? If the issue was found at your customer receiving inspection, how do you classify this? It is up to your company and your customer. They may require an 8D Analysis. Or they may require a simpler 5D Analysis. For example if the customer finds a label issue, then 5D may be sufficient. If they find defects and the customer cannot use the parts then 8D may be needed. If your customer found the issue during their processing with your parts, then classify that as unsuspected costs and you should issue an 8D Analysis. For 8D corrective action process you need to verify the actions were completed. You usually prove this with just a name and date of the verification. You want to make sure the verification takes place by someone different than the person conducting the action. However, when addressing external (found by a customer) issues with the 8D process and with any 9D corrective action, you should describe how you conducted the verification. Describe exactly what the person did to make sure the action was executed. This article discussed the differences between D8 steps and the 8D steps. It also provided a flowchart for selecting an appropriate corrective action method. Companies face the difficulties of issuing the exact corrective action approach and keeping everything for corrective action together. 8D Manager lets you simplify all of this. You can quickly issue 5D, 8D, 9D corrective actions and create professional reports. 8D Manager assures you don’t skip a step. 8D Manager lets the corrective action be as simple or as complex as you need. 8D Manager stores them all in one location and you can review and edit any of them quickly and easily.